Italian composer Maurizio Malagnini has written a new piece of music celebrating fell running in the Lake District. Running in the Clouds is a musical diary including memories of legendary Bob Graham runner, Joss Naylor. The 70-mile (113km) Bob Graham Round includes Skiddaw, Helvellyn, Scafell and Scafell Pike. 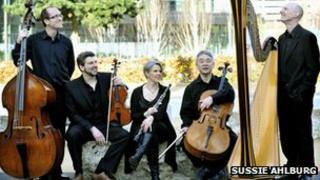 The BBC Philharmonic Orchestra will premiere the work in Kendal on 14 January 2012. Bob Graham made the first fell run of 42 Lake District fells in 24 hours during 1932. The route starts and finishes at the Moot Hall in Keswick. Maurizio Malagnini said: "The music takes us through the most energetic and heroic moments of the ascent. "It culminates in the final movement, A View from Yewbarrow. Here, Joss is lost in the mist until the wind blows away a cloud and uncovers an incredible view from the summit." The music has been commissioned by BBC Radio 3. Richard Wigley, general manager of the BBC Philharmonic and a keen fell runner, said: "The inspirational challenge created by Bob Graham in the 1940s is matched by the inspiration of an orchestra in full flight; the full flight we experience when our minds are allowed to float free from daily life." Extracts of the work are to feature in a BBC Radio 4 documentary, to be broadcast at 11:00 GMT. The programme follows two stories: the development of Malagnini's music and the attempt of two runners seeking to complete The Bob Graham Round. The full work will receive its world premiere with the BBC Philharmonic at Westmorland Hall, Kendal, on 14 January at 19:30 GMT, conducted by Garry Walker. The concert will be broadcast live on BBC Radio Cumbria and recorded for future broadcast by BBC Radio 3.